First let me start by saying that this is an LDS non-fiction book. It is about religion and spirituality. I love President Uchtdorf. Whenever he speaks I feel his calm and his sincerity. He is an engaging personality. 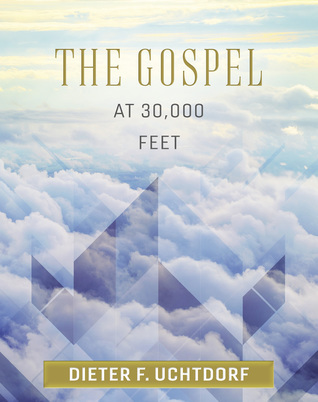 This book is a compilation of some of his talks that incorporate flying analogies, which he is know for since he spent a good part of his life as a pilot. There isn't anything new here, but I love the way all these talks were put together in a way that flowed so well from one topic into the next. I thought the layout and colors were pleasing and I love the few pictures we got of President Uchtdorf along the way. "It isn't until you come to a spiritual understanding of who you are that you can begin to take control of yourself. As you learn to control yourself, you will get control of your life. If you want to move the world, you first have to move yourself." "The greatest battle of life is fought out within the silent chambers of the soul. A victory on the inside of a man's heart is worth a hundred conquests on the battlefields of life. To be master of yourself is the best guarantee that you will be master of the situation. Know thyself. The crown of character is self-control." I have read many reviews saying that the audio version of this book is the best because President Uchtdorf is the one reading it. I would love to have heard this book because I love listening to President's Uchtdorf's voice! Either way it is a fantastic compilation with much encouragement and love that will remind us all that we can be a little better each day.